The Asus Zenfone Max Pro M2 has launched in India today at a starting price of Rs 12,999. The price range at, which the phone has been launched by the company brings it close to the Xiaomi’s Redmi Note 6 Pro. The Asus Zenfone Max Pro M2 is a successor to the Max Pro M1, which was launched earlier this year. The smartphone is launched with a Qualcomm Snapdragon 660 processor and a dual camera setup the back. The company has even made upgrades in camera, display, and processor. On the other hand, the Xiaomi Redmi Note 6 Pro, which is the company’s first device that has dual camera setup at both front and back is quite a popular smartphone in the budget segment. 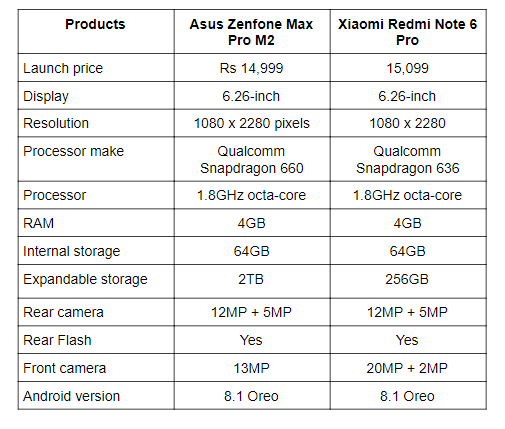 Let’s do a quick specs comparison of these two to see where does the new Max Pro M2 stands in compare to the Xiaomi Redmi Note 6 Pro. The Asus Zenfone Max Pro M2 comes with a 6.3-inch notched full HD+ display that offers a resolution of 1080 x 2280 pixels. On the other hand, the Xiaomi Redmi Note 6 Pro features a 6.26-inch display that offers the same resolution as the Max Pro M2. When it comes to the processor, the Asus Zenfone Max Pro M2 is powered by a Qualcomm Snapdragon 660 processor, which is slightly faster than the Qualcomm Snapdragon 636 in Xiaomi Redmi Note 6 Pro. 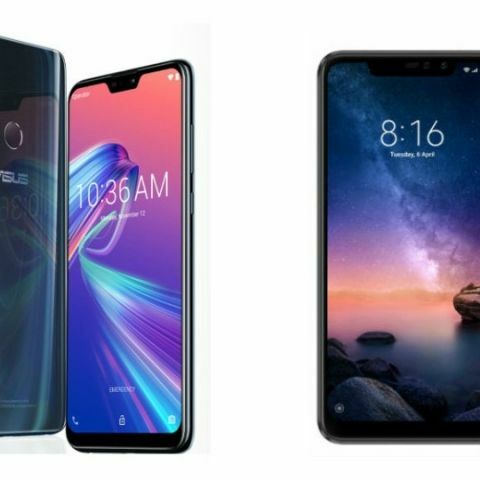 The Asus Zenfone Max Pro M2 has been launched in three variants 3GB/32GB, 4GB/64GB, and 6GB/64GB, while the Xiaomi Redmi Note 6 Pro is available in 4GB/64GB and 6GB/64GB RAM options. As far as the cameras are concerned, the Xiaomi Redmi Note 6 Pro features a dual camera setup at both front and back, which is also the main highlight of this smartphone. The Asus Zenfone Pro Max M2 also sports a dual 12MP + 5MP rear camera. At the front, it has a 13MP sensor. The Asus Zenfone Pro Max M2 will be available on Flipkart from December 18, while the Xiaomi Redmi Note 6 Pro is available on Amazon for Rs 15,099 in India.